As much as I would love to have soups and salads every day and limit carbs from rice and other grains, is the true South Indian I am, I cannot simply stop preparing dosas, idlis and other dishes I have been eating all these years. It’s not just food we are talking about. It’s more than that. We are passing our heritage, custom, and rituals to our children through food. So I’m very happy that my son loves Indian food as much as he enjoys his pizzas and pastas. But I do have to agree that sometimes it can be boring to eat the same, plain dosa and idli each and every time. So that’s when we have to unleash our creativity to make our meals interesting. That’s how the colorful cocktail idlis, stuffed idli roast, ragi poori came into existence. 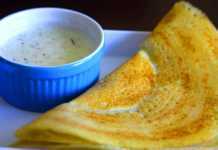 This sponge dosa recipe also joins the list. 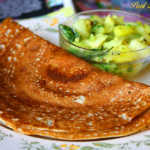 I came across this recipe for pumpkin dosa in a magazine and tried it almost immediately and we all loved it. It was very soft and looked very pleasing. After a couple of times trying it just with the pumpkin, one day I wondered why not try it in different colors using different vegetables and it was not a surprise that my son was super excited. I couldn’t tell any difference in taste but for some reason, my son liked the orange dosa more than the other two. He said that it tasted better. Wash, rinse and soak raw rice, urad dal and fenugreek seeds (if using) in water for 3-4 hours. Then grind it altogether in a wet grinder into a smooth batter adding as much water as needed. Do not add too much water. 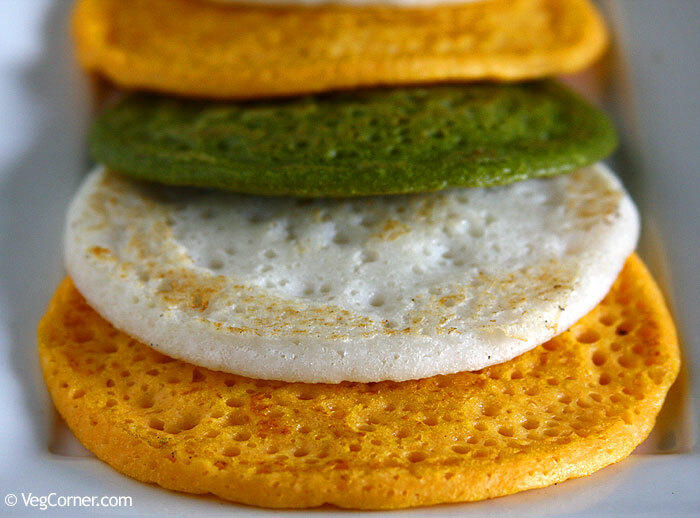 The dosa patter should be in the consistency of pancake batter and not as stiff as idli batter. Meanwhile prepare the vegetable you are going to use in the dosa. Peel the skin and either chop it finely or grate it. 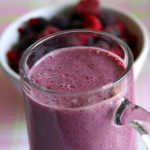 Make a smooth paste of it in a blender without adding water and set aside. Once you get the right consistency for the dosa batter add the pumpkin puree too and let the grinder run for a couple of minutes so that it is blended well and you get a nice orange color dosa batter. Transfer the batter to a bowl big enough to allow fermentation and thereby increase in volume. Add salt and mix it well. Leave the batter in a warm place for at least 8 hours or more if possible. When it is time to prepare the dosa, stir the batter with a ladle and heat a griddle. The pan is ready when it sizzles if sprinkled with few drops of water. Take a ladleful of batter and place it on the middle of the pan and flatten it as thick or as thin as you want with the back of the ladle. Within a minute or so you can see a whole bunch of sponge pockets throughout the dosa and the batter would have cooked completely. Now add little oil around the dosa and flip it over and let cook for another minute or so. This pumpkin dosa tastes pretty much like the usual dosa, but what makes this one unique is its texture and color. These dosas are unbelievably super soft. Another plus, this batter can create soft dosas as well as thin and crispy dosas. It all depends on how thick or thin you make it. So if you are feeding toddlers or serving elderly people you can make the soft version and for others who like crispy dosa make it thin, drizzle it with some homemade ghee and you have got yourself a paper roast. Fenugreek seeds do not grind very smooth if you have not soaked it long enough. So I usually soak it separately in very hot water. I also keep fenugreek powder in hand and use it when I forget to soak the seeds. For the green dosa I used a mix of fresh baby spinach and cilantro. For the white dosa it is ash gourd. You could also try it with tomatoes, carrots, and beets. The above recipe is the base recipe if you are just trying it with one vegetable. When I tried all the 3 colors together, I doubled the recipe for the dosa batter. After the batter was ready, divided it into three portions and mixed the purees separately to each portion and fermented it. Actually, the pumpkin batter was not very orange initially, so I pureed about another 1/2 cup of pumpkin to get the desired color. I think a combination of pumpkin and carrot will give a better color than using the pumpkin alone. 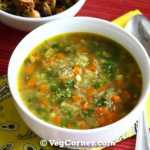 For a grown-up version, you could also add some red chillies and green chillies while preparing the vegetable puree. If you are going to make it as thick, soft dosas you can eliminate oil completely because it comes off the pan without sticking. 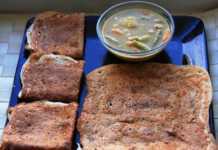 This sponge dosa retains its softness even after 4-5 hours making it a nice lunch for kids. Add some curry and roll it and you have got yourself a dosa wrap. You could also prepare a tri-color dosa sandwich by layering one of each color and spreading different chutneys between each layer. Or how about a dosa pizza or quesadilla? Nice dosas. Will try it. 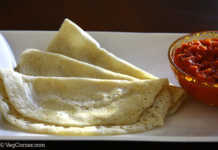 Can I ferment the dosas for 8 hours with vegetables in the batter? Will it be good? Never tried it. It’s totally fine, Priya. We do it all the time. Even with lady’s finger tops and bottoms. We live in Colorado where the winters are cold. I have trouble with fermenting any batter (be it idli or dosa). I read that you live in Pensilvania which can’t be any better weather wise in winter. So I was wondering if you have any techniques for fermenting the batter. I tried putting batter in Oven, turning on the light in the oven, covering it with warm blanket. Nothing really worked so far. Any ideas, tricks, tips…..
We live in a colder climate too (Britain), and manage to ferment dosa and idli batter very easily by keeping the batter in the airing cupboard (where the water tank is). Usually the batter ferments overnight like this! If you have shelving space designed to keep towels etc within the airing cupboard, its easy to store the container as well. If you do not have shelving, you can keep the container in a tray (oven tray) and keep it either on top of the water tank or on the floor of the cupboard. If the batter over-ferments, all spills will be caught within the tray. Thanks M for the tips. I too keep the dosa batter container on a plate to catch drips. Once I kept in my oven with lights on for fermentation during witner only to see a lot of batter over flowing and making a big mess inside the oven. That’s when I learned my lesson. 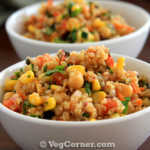 Lookin very yummy…I will try these as my kids luv south Indian food. I’m sure they will love it Ripsy. A very nice recipe, Will try this soon. Soo cute and yummy spongy dosas..
very good.. definitely i’ll try ash gourd and pumpkin..u can also try chinese dosa using schezwan sauce & vegetables..its mappis favorite!